"Begun in the 1980s and worked on until the author’s death in 2003, Woes of the True Policeman is Roberto Bolaño’s last, unfinished novel. The novel follows Óscar Amalfitano—an exiled Chilean university professor and widower—through the maze of his revolutionary past, his relationship with his teenage daughter, Rosa, his passion for a former student, and his retreat from scandal in Barcelona. Forced to leave Barcelona for Santa Teresa, a Mexican city close to the U.S. border where women are being killed in unprecedented numbers, Amalfitano soon begins an affair with Castillo, a young forger of Larry Rivers paintings. Meanwhile, Rosa, Amalfitano’s daughter, engages in her own epistolary romance with a basketball player from Barcelona, while still trying to cope with her mother’s early death and her father’s secrets. After finding Castillo in bed with her father, Rosa is forced to confront her own crisis. What follows is an intimate police investigation of Amalfitano that involves a series of dark twists, culminating in a finale full of euphoria and heartbreak. 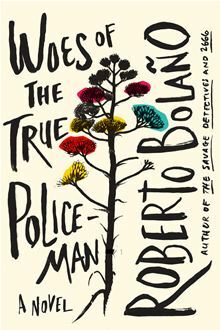 Featuring characters and stories from his other books, Woes of the True Policeman invites the reader more than ever into the world of Roberto Bolaño. It is an exciting, kaleidoscopic novel, lyrical and intense, yet darkly humorous. Exploring the roots of memory and the limits of art, Woes of the True Policeman marks the culmination of one of the great careers of world literature." "According to Padilla, remembered Amalfitano, all literature could be classified as heterosexual, homosexual, or bisexual. Novels, in general, were heterosexual. Poetry, on the other hand, was completely homosexual." The Fall of the Berlin Wall (I), Amalfitano and Padilla (II) and Rosa Amalfitano (III) follow the semi-picaresque adventures of a Latin American studies academic and his teenage daughter as he is booted from place to place when his homosexual inclinations are discovered by his bosses, so he ends in Santa Tereza - the location of the main part of 2666 of course - after a last cushy spot in Barcelona where he meets and beds a wannabe young charismatic poet who has a lasting impression on him. "When Padilla was five his mother died, and when he was twelve his older brother died. When he was thirteen he decided that he would be an artist. First he thought he liked theater and film. Then he read Rimbaud and Leopoldo María Panero and he wanted to be a poet as well as an actor. By the time he was sixteen he’d devoured literally all the poetry that fell into his hands and he’d had two (rather unfortunate) experiences at the local community theater, but that wasn’t enough. He learned English and French, took a trip to San Sebastián, to the Mondragón insane asylum, and tried to visit Leopoldo María Panero, but once the doctors had seen him and listened to him talk for five minutes, they turned him away." The 4th part - J.M.G. Arcimboldi - discusses the work of an enigmatic novelist which has a similar name with the mysterious writer of 2066 and is structured as a series of reviews of his novels, though here the writer is French not German. At first glance, Hartmann von Aue is an examination of moments from the life of the German minnesinger, but the central character is really someone else: Jaufré Rudel." The last part titled Killers of Sonora is related both to The Savage Detectives and again to 2066 and offers capsules from Mexico's history with a somewhat picaresque bent while furthering a little more the tale of Amalfitano and his daughter in Santa Tereza. "Pancho Monje was born in Villaviciosa, near Santa Teresa, in the state of Sonora. One night, when he was sixteen, he was woken up and led half-asleep to the Monte Hebrón, a bar where Don Pedro Negrete, the police chief of Santa Teresa, was waiting for him. He had heard of him but never seen him. Accompanying Don Pedro were two old women and three old men from Villaviciosa, and lined up before him were ten boys about the same age as Pancho, waiting for Don Pedro’s decision." So yes, "Woes of the True Policeman" is unfinished but it offers in the first three parts a full experience while parts 4 and 5 read very well both as novellas and as connection with the author's larger body of work. Highly, highly recommended and a book I literally could not put down when I saw it by chance and opened it in a bookstore, so I had to buy it the same day and read it immediately!